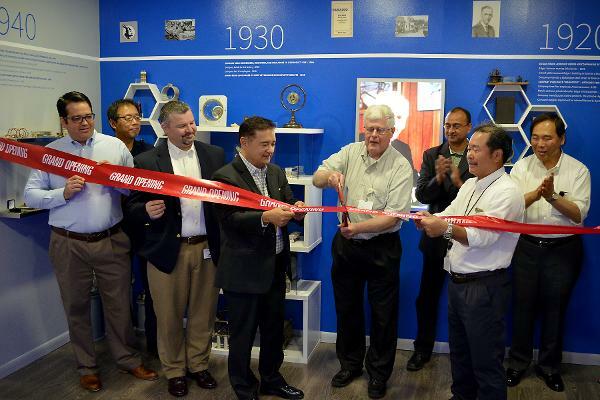 IRVING, TEXAS – June 21, 2016 – EF Johnson Technologies, Inc. debuted its newly restored museum with a ribbon cutting ceremony and open house on June 14, 2016. The EFJohnson museum showcases the company’s rich history in the LMR industry and highlights its growth, achievement, innovation and technological advancement through the past ten decades. The exhibit portrays EFJohnson’s unwavering dedication to maintaining its position as the mission-critical communications provider that goes above and beyond the call of duty. The museum includes personal artifacts from EFJohnson’s founder, Edgar F. Johnson dating back to the 1920s. Visitors can view the company’s first product, the inductor clip and see the transition to several of today’s product lines including Viking® and ATLAS®. The EFJohnson museum is located within its headquarters at 1440 Corporate Drive, Irving, Texas 75038. For additional information about the museum and to schedule a tour, kindly email Brittany Dixon at bdixon@efji.com. EFJohnson's John Oblak had the honor of cutting the ribbon during the official opening of the company's newly restored museum. Coinciding with the museum opening, Oblak released his book titled, “The First 90: A History of EF Johnson Technologies” and celebrated his retirement after a 32-year tenure with the company. Pictured left to right: Ryan Cooke, Tad Isa, Duane Anderson, John Suzuki, John Oblak, Karthik Rangarajan, Akira Suzuki, Yasumasa Akashi.